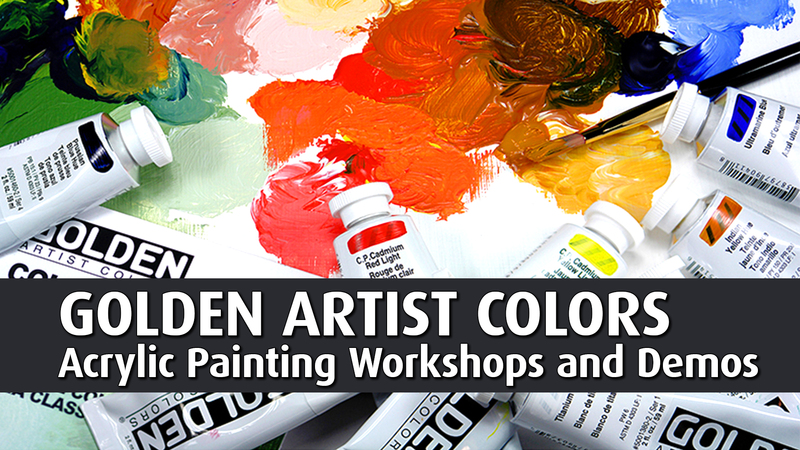 Join us for a three-hour Golden Paints workshop featuring three separate projects! Wild Water: Using watercolor paper and plenty of water, plunge into the flow and enjoy the voyage. Experience effects of Golden High Flow and Golden Fluid Acrylics. Wet into wet with water leading the way. Deep Ravine: Now on board (acid free backing board), learn how to add depth, texture and interesting dimension. Golden Heavy Body Acrylics will help you scramble down the gulch, scale the shale, scratch at the edges, shimmer at the shore and explore the heady world of rough Golden Gels. We'll use Pumice gel, Glass bead gel and more. Forging the Stream: A Fierce offering! Formulate a theme, a symbol, something simple, an emblem and then some. A synthesis on canvas. Blending and layering and delaying and engaging. Then selecting and eliminating and refining and highlighting, delighting in your findings. The blank canvas manifest. Please bring one canvas 16 x 20 or larger. All other materials are provided, but you may bring brushes and tools of your choice. All levels welcome. FREE Golden Paints Lecture/Demo - Free! The Golden lecture/demo is a fast paced one and one half-hour free educational presentation on acrylic paints, gels and mediums: an advanced technical explanation of acrylics, and their inherent possibilities. It covers information about the different types of pigments, viscosities, types of paints, grounds and color mixing. Various gels and mediums are demonstrated. The possibilities will blow your mind! You will learn how to extend paint to save money, and how to mix paints with gels to create unique textural surfaces. Get key information on color mixing, blending and controlling drying time. Learn how to use different products to make surfaces for watercolors, graphite, charcoal, colored pencil, oil and soft pastels. Techniques for the use of iridescent and interference paints will be shown. The lecture covers, lightfastness of pigments and health and safety concerns. A packet of literature and free samples of paint and gels are available for all those who attend. Follow up the Golden Lecture Demonstration with a place to partake in products to your hearts delight! Join Judy for a meaningful and satisfying experience with an array of Golden gels and paints. You will delve into layering and blending. Create textures and surfaces that are specific to your esthetic. This investment of your time and attention will yield you joy. As you dive into the study of Golden materials, there will be spots for reflection, places to mine your memory, and things to add to your mind. You will learn new ways to look at the world of art materials. Judy will share her expertise and evocative creative nature sending you into your studio emboldened and eager to put your brush into paint.